With dedication of a new church building for St. Jude Parish in Mansfield only a few months away, local Catholics are abuzz with speculation about what they might find inside. Some have heard that stained-glass windows created in the 1850s will be installed, while others tell of life-size statues of the saints carved by artisans in Mexico. Still others are talking about an altar and pulpit tooled by craftsmen in Vietnam from some of the world’s finest marble. The list of Church treasures being discussed seems endless, even to the point of being somewhat unbelievable. 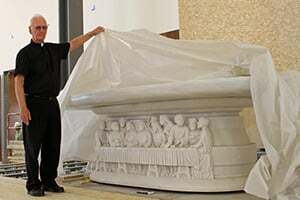 Some people have even passed along rumors that a white marble replica of the “Pietà” has been delivered to the parish and will be placed inside the church entrance. The fact of the matter is — it’s all true. More than 100 holy treasures have been secured, and the new St. Jude Church has been constructed to accommodate them. In an exclusive interview with the North Texas Catholic, St. Jude Church Pastor Father George Foley unlocked doors and pulled back tarps to reveal cherished artifacts that will be part of the diocese’s newest house of worship. On the first leg of the journey around the St. Jude Parish grounds, in a peaceful neighborhood at the historic center of Mansfield, Fr. Foley brings his visitor to the parish center. Meandering through dim hallways, Fr. Foley arrives at his destination — a quiet room tucked away at a far corner of the building. 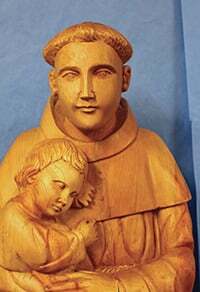 He inserts a key in the door, swings it open, flips on the light switch and says, “Meet Padre Pio, St. Anthony of Padua, St. Jude, and a host of others.” There, standing silently, but with a presence that fills the room, are life-size carved wooden statues of the saints. Soon they will take their places in the new church, but today they share storage space with 3-foot-high wooden Nativity carvings. Included are Jesus in his manger, Mary, Joseph, the three kings, a shepherd, a burro, and an ox. All were hand-made in Mexico. After visiting with woodcarvers in Mexico last year, Fr. Foley fell in love with their work. Their first creation was a 10-foot figure of Jesus on the cross. Just recently, it was placed 15 feet above the altar in the new church. Ready to arrive any day now from Mexico are carvings of St. Kateri Tekakwitha (the first Native American saint in the U.S.) and an angel. But sharing space with the saints already in this temporary storage room are more treasures. Along the floor are 14 ceramic Stations of the Cross, painted in earth tones and finely detailed. They were obtained by Fr. Foley from a Catholic church that was closed in Milwaukee. The Stations of the Cross are among many artifacts traveling from Catholic churches closing in northern cities to the new St. Jude being built in Mansfield. Fr. Foley brings his visitor to the new church building for a glimpse of four antique stained-glass angel windows already installed along the top wall. They are protected by plastic from dust stirred up in the final construction phases of the church interior. The church is filled with painters, electricians, trim specialists, and a host of others. In all, 30 stained-glass windows will add dramatic color to the church, including 14 antique windows repurposed from closed churches and 16 transferred from the current St. Jude church building. Fr. Foley traveled to Boston, where he obtained a 163-year-old stained-glass window depicting John the Baptist, with an angel looking on as he baptizes Christ. A master stained-glass artist in England created the piece. Three additional window panels were also obtained in Boston. Fr. Foley also secured six stained-glass window panels from a church that was closed in Minneapolis. All of the windows are being reconditioned in Waco. The priest makes his way to the sanctuary and draws back a large sheet of heavy plastic. Beneath it is a white marble altar from Vietnam. On the front is a stunning carving of Christ and his disciples at the Last Supper. Even a non-believer would have to pause and admire this work of art. “Where do you even see something like this?” asks Fr. Foley. A marble podium and lectern, also carved in Vietnam, sit nearby and are still uncrated, while a matching baptismal font has just been unpacked. Across the walkway from the new church building are the parish offices. It is here, in a conference room adjoining Fr. Foley’s workspace, where more treasures are stored. A beautiful statue of St. Thérèse of Lisieux, obtained from a closed church in Milwaukee, stands next to a conference table. Near her is a painting, extending from floor to ceiling, of Our Lady of Guadalupe. On tables and along the floor are other treasures. Just across the street, inside the garage of the church rectory, Fr. Foley prepares to unveil a masterpiece. The priest enters a security code and up goes the garage door. To the right is his SUV, and to the left is a recasting of Michelangelo’s “Pietà.” The piece weighs 800 pounds, measures 7 and a half feet high, 6 feet wide, and 3 and a half feet deep. Arte Devine, an organization based in Beverly Hills, California, donated it. 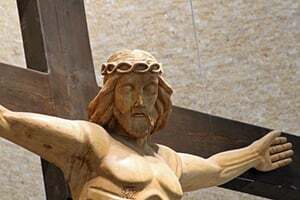 According to the Arte Devine website, the replica is cast in Carrera marble from a mold derived from the original “Pietà” and produced under license with the Vatican Observatory Foundation. “The result is a precise reproduction that is faithful to the original “Pietà” in every detail,” according to Arte Devine. Reflecting on three busy years of drawing up plans with his building committee, working with the Diocese of Fort Worth, and recruiting help from dedicated and generous parishioners on the project, Fr. Foley sometimes has difficulty believing that the transformation is taking place at his parish in Mansfield. The current church seats 667 people, far too few for a dynamic parish that now includes 3,700 families. The new church, with a 23,000-square-foot interior, can seat 1,700 people. A few months away from his 80th birthday, Fr. Foley possesses a clear vision for the future of St. Jude Church in Mansfield and an appreciation of its past. His passion for the entire Catholic Church is as healthy and vibrant today as it was when he was ordained in Pretoria, South Africa, 55 years ago. “God has been very good to me,” says Fr. Foley, reflecting on his life and the latest accomplishments about to unfold.